If you are looking for sofa beds with queen size mattresses but need to maximize the space by having a compact overall size we may just have the right solution right here; a sofa bed which can boost a queen size mattress for comfortable two persons sleeping able to fit into relatively smaller areas. We have been successfully proposing a sofa bed version with narrower armrests and a modern classic design. A mere 80" in lenght can guarantee a 63" queen size mattress and if this size is still too much for the space it can arrive to a smaller size by eliminating the amrests and having an arm less sofa bed. But this modern sofa bed is not only conceived for smaller spaces because it features so many sectional elements to create sectional compositions with corner or chaise lounges. Furthermore, the collection include single armchairs convertible into single beds, ottoman with storage and chaise lounges with storage. The opening system of this modern sofa bed is as clear as it could be. 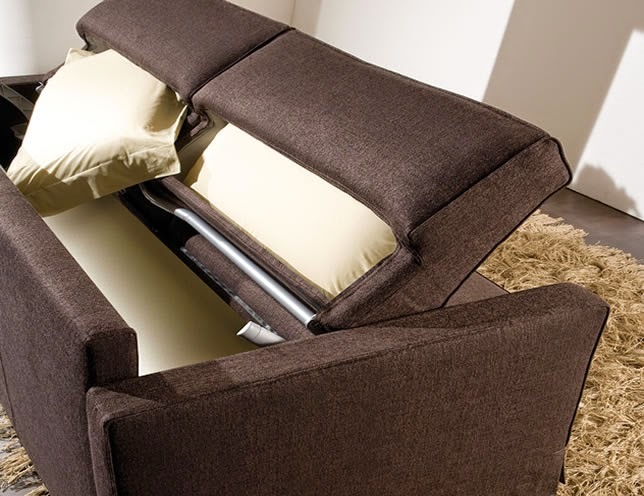 By simply pulling forward the back cushions the sofa unfolds into a sofa bed with a simple movement. Practical details are also unveiled : two hidden large pockets positioned on the back can serve as storage for pillows or sheets. Two mattresses options are available: a large pocketed springs mattress or a polyurethane foam mattress for more firmness. There are multiple choices when it comes to materials for the cover: our collection presents modern textures and patterns as well as vibrant or subtle tones. Full soft grain leather or faux leather available in many different colors. The cover is completely removable and the sofa can easily be disassembled for easy transportation if you need to move to a different place. The back and armrests are removable, cushions can be unzipped from the main structure and the front base panel is removable as well. If you are looking for a modern design sofa bed with compact size this is definitely a choice to consider. It's time for a free gift!